Guards are always one of the best defensive units in Clash Royale due to their good DpS, low Elixir cost and especially their shields! 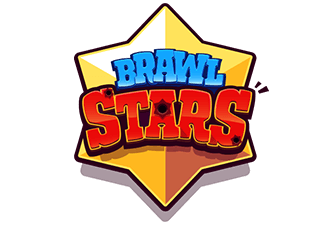 They are excellent in tons of matchups, If you know how to use them properly. I have been using them for months, since the first day they got released. Below is my short do and don’t do guide to the beloved Guards! Guards are beefed up Skeletons, which are unlockable from Arena 7 (Royal Arena). Guards have shields and adorable small spears. Regardless of the incoming damage, the shield can always block it. However, underneath that shield, they are very similar to Skeletons in damage, HP and movement speed. 18/5/16, increased the Guards’ hitpoints and damage by 8%. 21/6/16, removed the pushback when their shields break. 12/12/17, increased the Guards’ hitpoints and damage by 5% and their hit speed to 1.1 seconds (from 1.2 second). 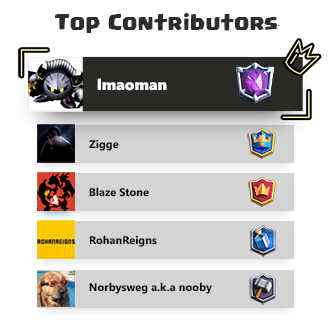 Guards do the best job when they don’t have Barbarians, Valkyrie, Minions or Fire Spirits. Use them on your side to get the first strike! Yes, they are not melee troops. They carry not only the shield but also a small and adorable spear. They have a very short ranged mechanic, like the Prince, so they can easily avoid body-blocking while clumping up (not like Barbarians) and while attacking a single unit. One of the most interesting facts about the Guards is that they can outrange Valkyrie, as long as the Valkyrie is locked something else. Due to the attack range and their attack speed, they can get the first strike most of the time, making them very strong on defense. 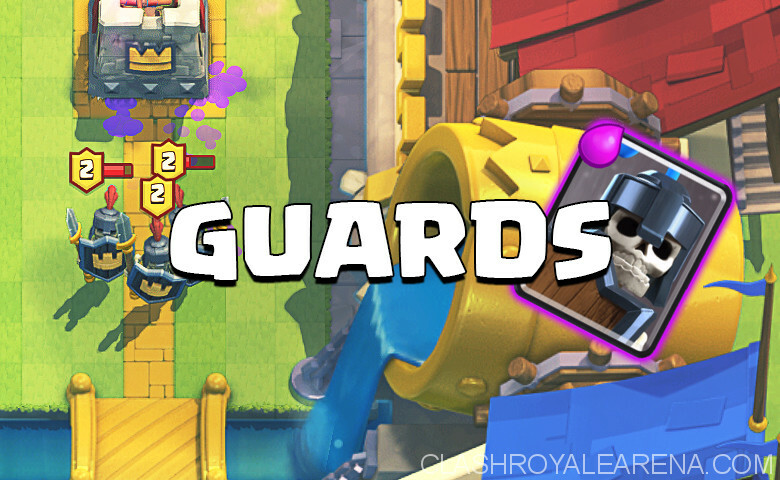 Guards are the hard counter to any single-target and troop-targeting unit in Clash Royale. Single-target units usually have pretty high damage-per-hit, which is nothing when dealing with the shield. Regardless of damage, nothing can break through the shield. P.E.K.K.A needs 6 swings to remove Guards (don’t try this at home guys). Guards always spawn in an upright triangle, having a small space in the center and 1 Guards facing forward, as you can see in the screenshot below. 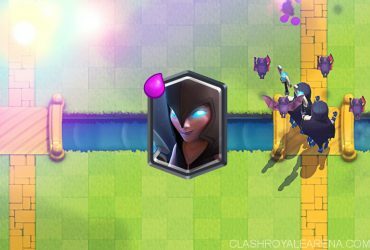 You can easily take advantage of this by surrounding splash troops like Witch, Sparky or Wizard, making them able to hit 1-2 Guards at one time. One of my favorite trick is to drop the Guards in front of a charging Dark Prince. The Dark Prince splash damage can only hit the first Guard, giving the other Guards full HP shields to deal with other incoming threats. 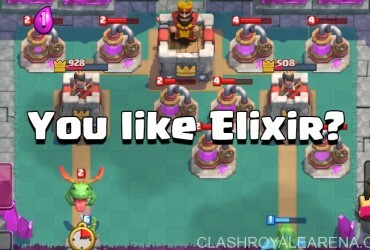 I usually use Guards to kite air troops like Mega Minions, Minions, Lava Pups, Baby Dragons, Inferno Dragon… Using Guards in these situations always give you positive Elixir trades. As the air units is approaching your Tower, drop your Guards in their agro range to protect your Tower. 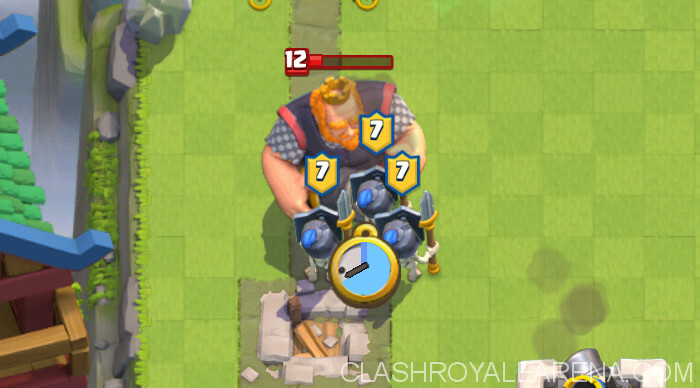 Each Guard can take 2 hits from the Mega Minion, giving your Tower enough time to take it out. Inferno Tower has to recharge after breaking every single shield. Kiting Baby Dragon is a bit harder as you need to make sure that your Guards are not in Baby Dragon’s attack range due to the deploy time. Guards are situational opportunists. They are extremely useful in many situations but outclassed by Goblins and some other troops. Hold them until the card they counter reaches your side of the Arena. Assuming you use Guards to deal with Hog Rider, then your opponent drops a Sparky at the bridge, what would know do? Know when is the best time to use them and you will do great! Use them with experience. Hands down Guards are a fairly technical card. Keep practicing and remember what matchups are the best, know where are the best places to drop them. Guards will lose lots of potential If your opponent can quickly react to them. For example, your opponent can easily drop the Valkyrie in the middle of the group to take them out. I always recommend using Guards on counter-push but not using them proactively on offense. Drop them against splash troops. Of course there are a few exceptions but Guards don’t work well against most splash troops. Fire Spirits are the worst matchup as they can kill Guards in the blink of an eye. This is very important If your opponents are likely using cards at Tournament standard. If you use level 1 or 2 Guards, your opponent can easily Zap their shields off. Make sure your Guard shields can survive Zap!